Want to become a better Scrum Master, add new tools to your toolbox, and become more effective and confident? Want to deepen your understanding and increase your superpowers? 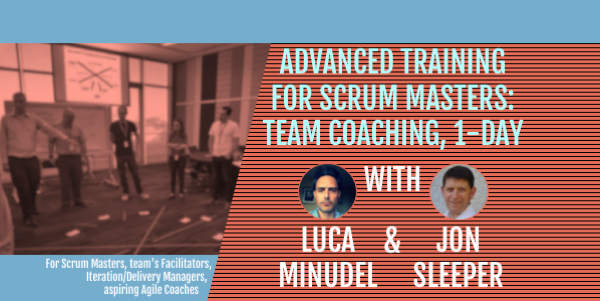 Want to bring your Scrum Mastering to the next level, and maybe start to prepare for your next career move? This one-day energetic hands-on training consists of practical group activities, presentations of essential concepts, and class discussions. Participants will explore broadly and practice all the key aspects of being a Senior and experienced Scrum Master. Further consideration will be given to professional coaching skills such as deep listening and coaching conversations. Participants will also explore their strengths, their gaps, and areas where they want to focus on, for personal development as Scrum Master. The whole training is underpinned by the philosophy of learning by doing and learning by example. - negotiate your team coaching relationship with the client. CSM, CSP, ICP-ACC Agile Coach. For Scrum Masters, team's Facilitators, Iteration/Delivery Managers, aspiring Agile Coaches. Advanced Scrum Master training: Team Coaching, Saturday, 23 March 2019, London. You'll be contacted in the next 2 working days to confirm the registration and the payment details.